Online auction site eBay suffered a massive cyber-attack sometime between February and March which led to the personal information of 145 million eBay customers – including British users – being compromised. eBay lost control of data containing usernames, contact details and passwords of its customers. On 21 May, eBay made the breach public knowledge by urging all of their customers to reset their log-in details as soon as possible. YouGov’s BrandIndex tool looked at eBay’s brand health by measuring the scores of its Buzz (which measures whether people have heard anything positive or negative about the brand in the last two weeks), Impression (measures if people have a ‘general positive’ or ‘general negative’ feeling about the brand) and Ad Awareness (measures whether people have seen an advert from the brand in the last two weeks). All respondents were age 18 and over. On 20 May, the day before the attack was announced, eBay’s buzz score stood at 9.1. In the next couple of weeks following that, the score rolled down to -14.3 then quickly picked right back up after 4 June. Similarly, eBay’s Impression score stood at 32.3 on 20 May, but fell to 19.1 within two weeks. Just like its Buzz score, the Impression score rose to its previous level after 4 June. Immediately after eBay urged users to change their password, they also sent out newsletters, apologising for any inconveniences caused and offering further solutions in protecting their accounts. They also made it much easier for users to update their details by implementing a new “Reset Password” button on the website homepage. Their proactiveness may have impacted the turnaround of their Buzz and Impression scores. 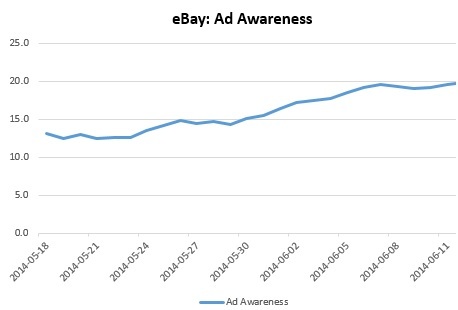 Judging from eBay’s Ad Awareness scores, the number of people who had seen an advert from eBay slightly increased. On the 20 May, figures stood at 13.3 and had slowly crept up to 21.3 by 7 June. eBay did not launch an advertising blitz campaign after the news of the attack, however their ongoing ads and emails to users may have become more noticeable because of the news. For a while, peoples reaction to the attack saw eBay’s overall customer perception plummet down. However, this was a well-handled crisis that was turned around quickly, thanks to their proaction.